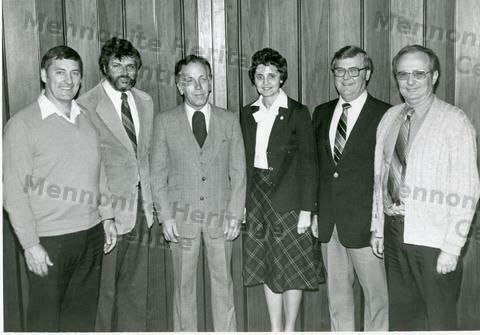 This is a photo of MDS Executive Committee members and staff at the 1982 All-Unit Meeting. (Left to right): Syd Reimer, chairman; Paul Longacre, treasurer; Carl Nussbaum, member; Ruby Schmitt, secretary; John Jantzi, vice chairman and Nels Hostetter, executive coordinator. Syd Reimer, chairman; Paul Longacre, treasurer; Carl Nussbaum, member; Ruby Schmitt, secretary; John Jantzi, vice chairman and Nels Hostetter, executive coordinator.